(Bloomberg Opinion) -- If only Boeing Co.’s 737 Max woes were as simple as a branding issue. It is worth underscoring that last sentence. What does in fact Trump know about the aviation industry or aircraft certification processes? It’s easy to forget that before Trump, it would have been taboo for a sitting president to offer unscripted public advice to a major corporation and government contractor. He’s not wrong that Boeing’s challenges with the Max have evolved from what could have been a relatively simple software engineering issue into a political and consumer nightmare – the kind that might forever taint a brand. If Boeing had acted more urgently to roll out a fix following the first crash of a Lion Air flight in October, there may never have been a second accident. 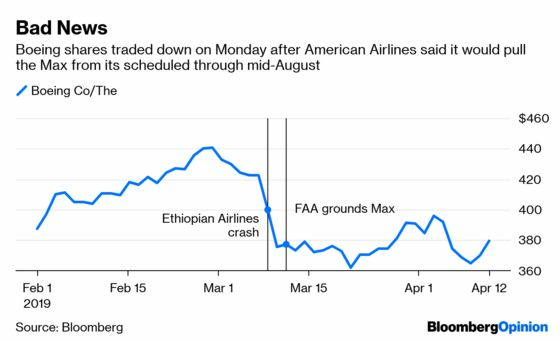 The actions of the pilots on the Ethiopian Airlines flight that crashed in March have also drawn scrutiny and raise bigger questions about training in emerging markets. But at the crux of their struggle over the plane was an erroneous sensor reading that triggered the same anti-stall software system involved in the Lion Air crash and pushed the plane into a dive. Now the FAA finds itself and the rigor of its aircraft certification process under increasing scrutiny, with foreign regulators no longer willing to accept its word as gospel. Before the Max was grounded, travel booking site Kayak.com added a filter to let worried consumers screen out the flights on the 737 Max. Garuda Indonesia is canceling a $4.8 billion order for the Max because its passengers don’t trust the plane and Ethiopian Airlines has said it’s reviewing its own plans to buy an additional 25 Max jets because of the “stigma” associated with the plane. So is that the kind of problem that a new name can fix? Maybe. But I’m not a huge fan of papering over consumers’ concerns with new labeling. 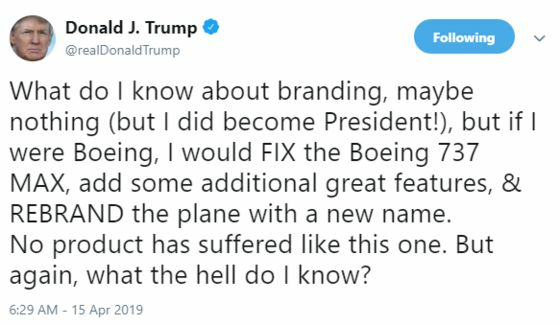 Trump helpfully suggests that it shouldn’t just be a simple name change, but Boeing should also “add some additional great features.” It’s unclear what those would be. One reason why the anti-stall flight-control system was added to the Max in the first place was because Boeing wanted to squeeze new, fuel-efficient engines onto the older 737 design, giving airlines the double cost savings of less fuel and minimal new training for pilots. That’s the primary draw of the plane for Boeing customers. The types of features that consumers might like – extra-fast in-flight WiFi, more leg room, bigger bathrooms, better snacks – are made at the discretion of the airlines who buy the planes. Perhaps Trump was referring to the previously optional safety gauges including a so-called disagree light that will alert pilots when data from the angle-of-attack sensors is materially off. But that seems like less of a sales pitch and more of a black eye for Boeing to acknowledge that “feature” wasn’t mandatory in the first place. There’s also the basic issue of what one might reasonably rename the 737 Max and whether that might be the kind of thing regulators would accept. You can’t get rid of the 737 part because, as I said, this plane was deliberately designed to operate as close to the older models as possible. What Boeing likely really needs is a true successor to the 737 – one that’s designed from the start to accommodate larger, more fuel-efficient engines. The middle-market aircraft that it has contemplated developing could be a test for its ability to develop a rethought version of the 737 and grow its services business, according to FlightGlobal. With a new, fully redesigned jet, Boeing could name it whatever it wanted.